Atlanta Beer Boutique | May is Homebrewing Month! 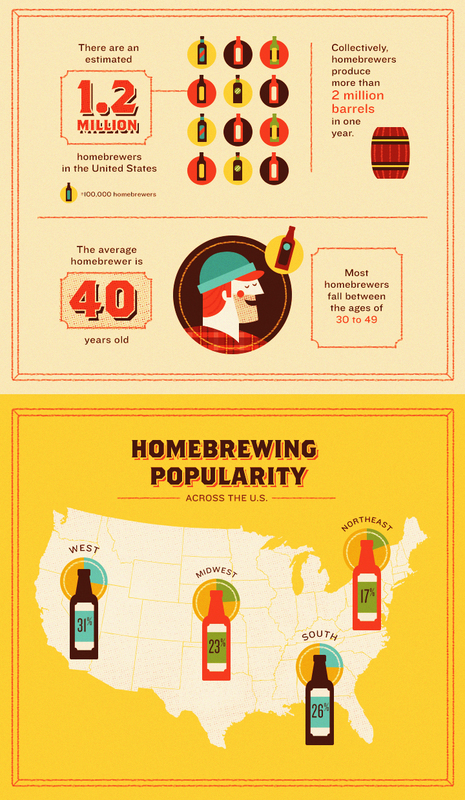 01 Apr May is Homebrewing Month! Not for reals, but we’ve decided to devote the whole month to this super exciting hobby. We’re kicking things off with this awesome article published by Custom Made. We’ll be back later in the month with an interview with my favorite local homebrewer, tips to get you started and more! I hope it’s helpful – cheers, y’all! In the craft beer world, solar panels and ambitious recycling programs have become the norm. Microbreweries from Alaska to Colorado to Massachusetts strive to be sustainable, local, and organic. But there’s an even greener way to drink beer: Make handcrafted ales in the comfort of your own home. 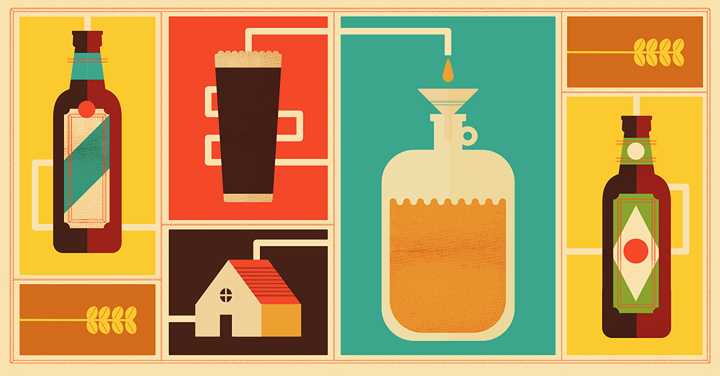 The 1.2 million U.S. homebrewers have some advantages when it comes to sustainability. They brew smaller batches and thus use fewer resources. They almost universally use kegs or reuse bottles, and they have no need for distribution, which is one of the most resource-intensive parts of commercial brewing. However, many homebrewers still have room for improvement on the sustainability front. Homebrewers tend to be less efficient and more likely to use malt extract and imported ingredients than craft brewers, according to the USDA. But that doesn’t have to be the case. An eco-minded homebrewer can take a number of measures to green their brewing operations. Beer consists of four primary ingredients: water, barley, hops, and yeast. Most homebrewers begin with kits containing tubs of malted barley extract (barley that’s been malted, mashed, and concentrated into a syrup). Malt kits are a great place to start but, as with all food preparation, using less-processed ingredients gives the brewer more control over the finished product and more ability to purchase sustainably grown, minimally packaged ingredients. Moreover, brewing with grains usually produces better tasting beer, and the better the beer, the more dedicated the homebrewer. 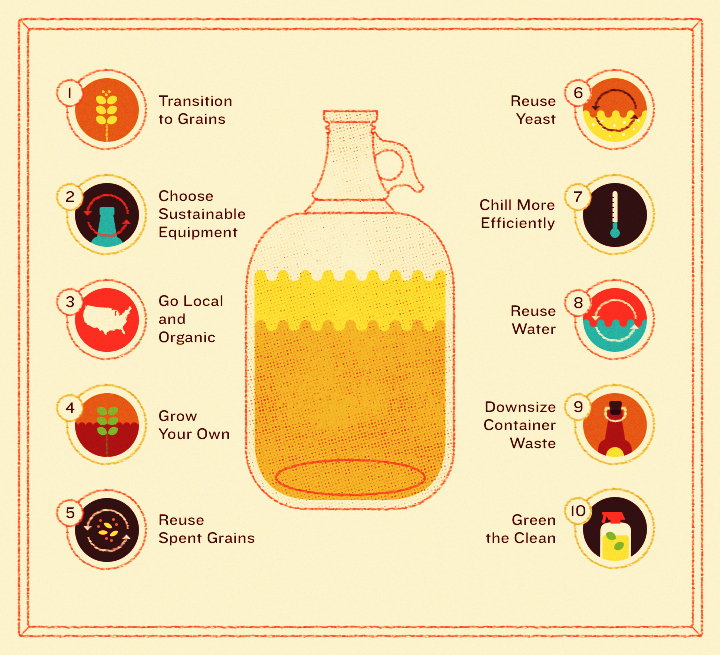 Transitioning to grains is a great first step toward sustainability. When using a malt recipe, look for an extract that doesn’t contain additives (most commonly corn syrup). Go for stainless steel and glass equipment over plastic options, which degrade over time and have a limited lifespan. Even small abrasions or scratches on plastic buckets can harbor bacteria and spoil a batch of beer, so many brewers go through a lot of buckets. Be sure to recycle them when they’re no longer usable. Before buying equipment, check Craigslist and other used sites for gently used carboys, kettles, coolers, and chillers. Today homebrewers have the option to brew with ingredients grown all over the world. For sustainability purposes, domestic usually beats imported, and less packaging is always best. How local can a homebrew be? It depends on the location. Most barley is grown in Montana, Washington, North Dakota, and Idaho. The Pacific Northwest is home to the majority of commercialhops production. But with new local economies sprouting up to keep pace with the craft beer industry, a hops or barley farm could be nearby. Ask at a local brew shop: Brew-shop employees tend to be friendly, helpful, and responsive to customer concerns. Support them and be sure to express your desire for sustainable ingredients. Choosing organic ingredients supports healthier ecosystems and helps ensure pesticide residues don’t end up in beer. In one study, beer grown with conventionally grown ingredients had detectable levels of five pesticides, including significant levels of Imidacloprid, an insecticide used heavily on conventional hops. Imidacloprid was recently banned in Europe because it is a threat to honeybees and may be dangerous to the developing nervous systems of children. Until recently, it was difficult to find organic hops because the USDA didn’t require craft brewers to use them to attain organic certification. The USDA changed its rules in 2013, and organic hops production has already increased exponentially. Sustainably grown options will hopefully be even more readily available in the future. It doesn’t get more local or sustainable than a brewer’s backyard. For beer with a truly local flavor, consider growing some ingredients on your own. Gardening enables homebrewers to experiment with unusual ingredients. Growing your own is also a way to remind yourself that, at its heart, beer is an agricultural product. Hops, peppers, and mint are three easy crops to try. The cones of this woody vine give beer its slightly bitter, citrusy flavor, plus it’s relatively easy to grow (depending on the climate). Ideally, hops need six to eight hours of full sunshine a day. They grow in most soil conditions, but require fertilization and good drainage. They are heavy nitrogen feeders. A good support system is crucial, because vines grow more than 30 feet high and can weigh up to 20 pounds. A fence, trellis, or the side of a building works well to support the vines. It takes a couple of years for hops to get established. They won’t produce many cones the first couple of years as they focus energy on their root system. After that, it’s important to keep them from taking over the garden: They wrap their spiky tendrils around everything in sight. Like hops, mint is easy to grow once it’s established. It tolerates poor drainage and varying amounts of watering, and it does well in partial sunshine. It’s best to contain mint, because it will happily take over an entire yard if allowed (which makes for aromatic mowing, but may not be desired). Once mint is harvested, it can be made into mint extract and added to the secondary fermentation. As with peppers, experiment with small batches: A little mint goes a long way. Consider incorporating other garden crops into the home brew. Hopped beer is a relatively modern invention. Before that, brewers made gruit using herbs in place of hops, such as yarrow, marsh rosemary, juniper berries, ginger, caraway seed, aniseed, nutmeg, and cinnamon. Pumpkin and berries can also make tasty ale additions. The most dedicated DIY homebrewers may want to grow barley. It’s relatively easy to grow, but harvesting and malting are labor-intensive. Once the beer is brewed, a homebrewer has pounds of spent grains. Don’t throw it away! It has all sorts of uses. Add spent grains to garden soil or a compost pile. Feed it to chickens. Or, even better, use it in a bread recipe (like this whole grain version) or to whip up a delicious spent-grain treat invented by the geniuses at the Brooklyn Brew Shop. Try their Spent Grain Peanut Butter Cookies,Spent Grain Brownies, or Spent Grain Waffles. Rather than purchase new yeast each time, a brewer can reuse the same yeast five to ten times. After the first fermentation, save the yeast that settles on the bottom of the bucket or carboy, wash it, store it, and use it within a few weeks for the next batch. (This practice encourages back-to-back homebrew batches. Since homebrewing is more sustainable, it’s important to keep the inventory stocked.) If stored yeast sits longer than a few months, make a yeast starter to make sure it’s still viable. Try this handy trick when brewing malt kits. Purchase a reusable one-gallon food storage container. Fill it with water and freeze it. Then during the cool down, add the frozen block of ice to the wort in place of a gallon of water. It will help cool the wort quickly. Be careful to lower the ice gently to avoid splashing hot wort. Immersion wort chillers are popular, because they cool rapidly, but they waste a lot of water. BloggerChris Jensen devised a way to use his without wasting water. He connects it to an aquarium pump and circulates the water through an ice-filled cooler and back into the chiller. Jensen says he’s cut his water waste by three quarters using this method. No matter the chilling method, there is some wasted water. Water conservation is important, because it takes a lot of energy to treat and deliver. According to the Environmental Protection Agency, “letting your faucet run for five minutes uses about as much energy as letting a 60-watt lightbulb run for 22 hours.” Moreover, the EPA says, “With the U.S. population doubling over the past 50 years, our thirst for water tripling, and at least 36 states facing water shortages by 2013, the need to conserve water is becoming more and more critical.” Don’t flush clean water from the brewing process down the drain. Use it on the garden or house plants, or in the washing machine. All equipment used in brewing must be clean and free from soap residue, and all equipment used after the boil must be sanitized. When possible, choose biodegradable, environmentally-friendlycleansers and sanitizers. Seven Bridges Cooperative, an online supplier of organic brewing ingredients, recommends using 5-Star PBW (Powdered Brewery Wash) or Straight-A to clean andIodophor to sanitize. Use a refillable spray bottle to save water.